Show some passion and pride for one of the Super Rugby powerhouses, the Blues when you grab yourself the all new adidas Auckland Blues 2019 Hooded Rugby Sweat in Dark Blue. The Blues of the Super Rugby league are one of the most successful teams in Super Rugby history. Like New Zealand's four other Super Rugby teams, the Blues were established by the NZRU in 1996. The Blues won the competition in its first two seasons, 1996 and 1997, and again in 2003. 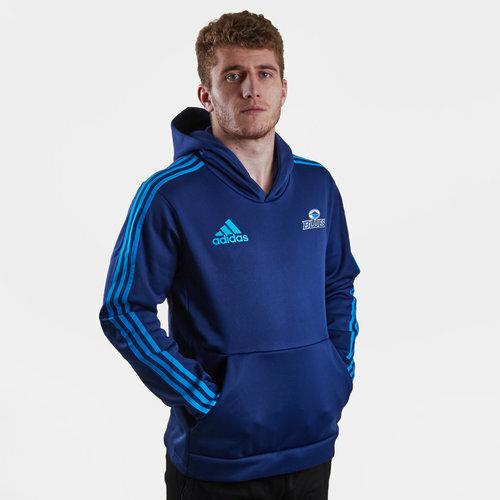 Additionally, the team were finalists in 1998 and semi-finalists in 2007 and 2011.
adidas are the Blues kit suppliers with this rugby-inspired hooded sweat paying tribute to the successful side. This sweat has been made from soft French terry fabric and comes in a regular fit making it wider at the body. This hoody comes in navy blue with the adidas classic 3 stripe motif in sky blue down the arms. The adidas logo is on the right whilst the Blues logo is on the left. The team's sponsor - nib - is printed on the back.